Two positive economic trends arrived on Friday that can be crucial to dealerships delivering vehicles and finance companies adding to portfolios. Bureau of Labor Statistics commissioner William Beach reported that nonfarm payroll employment increased by 196,000 in March, and the unemployment rate was unchanged at 3.8 percent. During the month, Beach highlighted notable job gains occurred in health care and in professional and technical services. Incorporating revisions for January and February, which increased nonfarm payroll employment by 14,000, Beach indicated monthly job gains averaged 180,000 in the first quarter of this year. In 2018, employment gains averaged 223,000 per month. Beach went on to mention average hourly earnings of all employees on private nonfarm payrolls rose by 4 cents in March to $27.70, following a 10-cent gain in February. During the past 12 months, Beach computed average hourly earnings have risen by 3.2 percent. From February 2018 to February 2019, the Consumer Price Index for All Urban Consumers (CPI-U) increased by 1.5 percent (on a seasonally adjusted basis), according to the latest federal information. “This was a Goldilocks report with a rebound in job growth to calm fears of an imminent recession, and wage growth that was solid enough without triggering inflationary concerns,” said Curt Long, who is the chief economist the National Association of Federally-Insured Credit Unions (NAFCU). “The Fed will be pleased, as it supports their present stance of holding firm on interest rates,” Long continued. Comerica Bank chief economist Robert Dye put the latest employment and wage update this way. “This was a solid report after a scare in February,” Dye said. 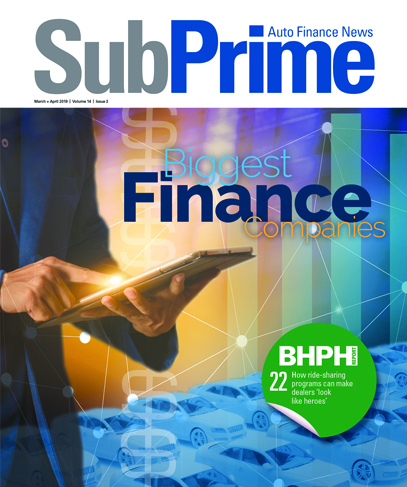 As recently reported by SubPrime Auto Finance News, the Federal Open Market Committee (FOMC) decided to maintain the target range for the federal funds rate at 2.25 percent to 2.50 percent after making multiple upticks in interest rates last year. And Fed chair Jerome Powell expects those rates to remain at the current level for the remainder of the year. Even as the latest wage data arrived, Powell already had an upbeat view of how wages are trending, of course, a critical piece of retail installment contract holders remaining current on their monthly payments. “Wages have moved up in the last couple of years and are now running at healthier higher levels, and that’s a good thing,” Powell said during a press conference when the Fed announced its latest interest-rate action last month. “And in fact, a lot of the wage gains have been going to lower paid workers as can happen late in the cycle, which is also a good thing. The economic news might be welcomed by dealerships and finance companies, which are already contending with the challenges of keeping sales on an upward trajectory with retail prices and interest rates already stretching potential buyers. While perhaps vehicles might not be rolling over the curb at rates enjoyed during the past couple of years, Fed policymakers are optimistic trends like what came to light on Friday are regularly seen. Federal Reserve Bank of New York president and chief executive officer John Williams shared his perspective during a speech at the Community Bankers Conference this week in New York. “I put the potential growth rate of the U.S. economy at about 2 percent, which is in line with the forecasts we’re seeing for this year,” Williams said. “But what the data’s telling us is that this period of slow growth isn’t an aberration — it’s the ‘new normal’ we should expect for the foreseeable future. “With the economy running close to our dual mandate goals, monetary policy is in the right place,” he continued. “Looking ahead, the Fed will watch the data and use monetary policy to keep the expansion on track. When growth is well above trend, raising interest rates to keep the economy on a sustainable path is the right decision. Equally, when faced with a crisis like the Great Recession, it’s incumbent upon policy makers to use every tool at their disposal to get the economy back on course. “It’s important to remember the change in the long-run economic fundamentals means that interest rates are likely to be lower than what we saw in the 1990s, for example. In addition, the slope of the yield curve is unlikely to return to levels typically seen in the past. This ‘new normal’ clearly has implications for banks, large and small,” Williams went on to say. “In conclusion, the outlook is positive. GDP growth is on track, unemployment remains low, and there are no signs of inflationary pressures building. And while many of you will miss the heady days of the 1990s when growth rates were at 4 percent, the economic fundamentals indicate that these are fundamentally different times,” he added.